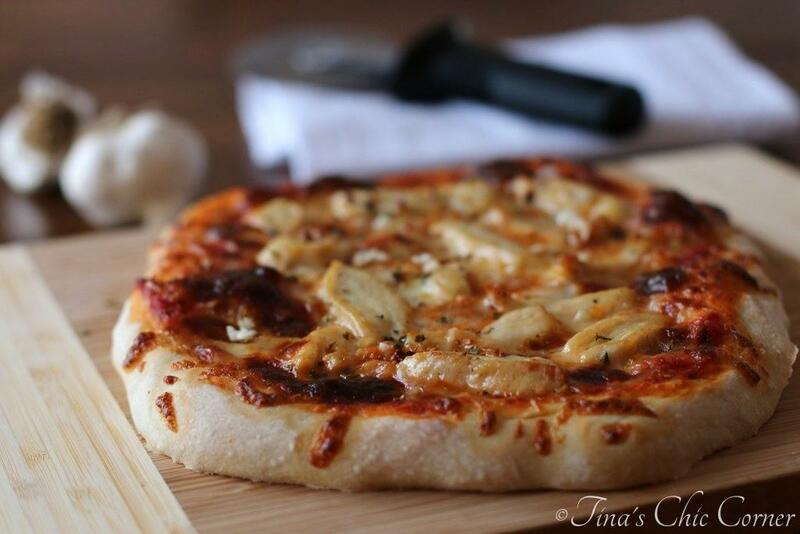 The creation of this delicious garlic chicken pizza goes back a few years. Many years ago my husband worked in New Haven (a town famous for their pizza) and would regularly enjoy garlic chicken pizza with his coworkers. When we were going to make pizza of our own, memories of those pizzas were what inspired the toppings. I’d never had anything like it, and as it turns out it was so yummy that now whenever we make pizzas for just the two of us, we make this combo. Heat a skillet over Medium heat with 1 tablespoon of the olive oil. Slice the chicken breast into strips. Cook the chicken in the skillet, seasoning with the salt and pepper and then remove it to a plate. Turn the skillet down to low and add the remaining 1 tablespoon of olive oil and the minced garlic. Cook the minced garlic in the skillet as it cools. This approach will help prevent burning the garlic. 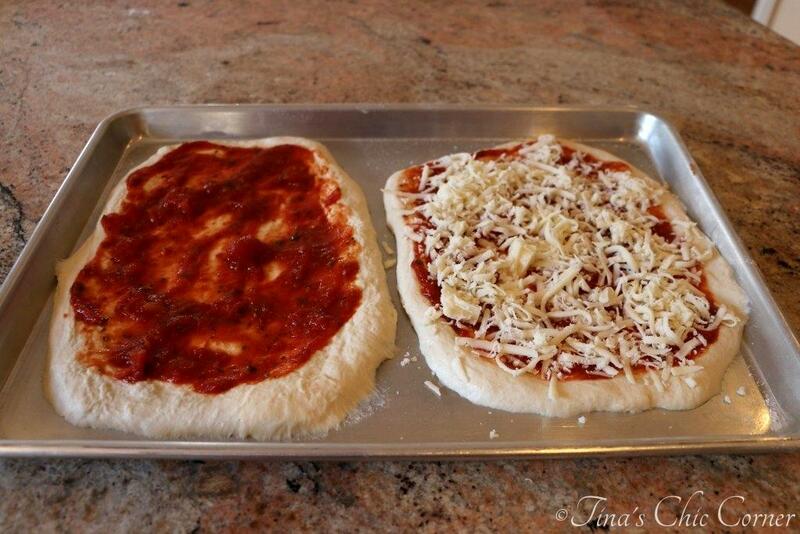 Spread the marinara sauce onto the pizzas. 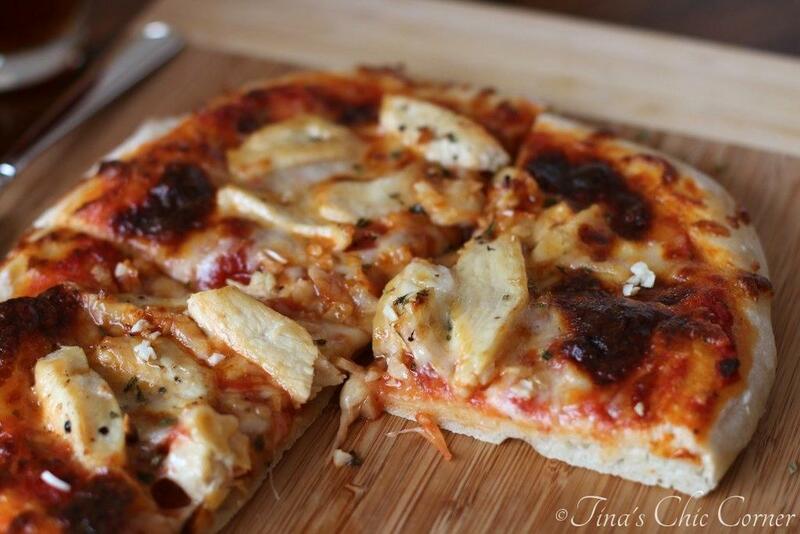 Top each pizza with the shredded mozzarella cheese, cooked chicken, and garlic. Cook them in the preheated oven for about 12 to 14 minutes or until the cheese is fully melted and has a few darker looking spots on it. I’ve hosted many “make your own pizza” dinner parties. Dave makes the dough ahead of time and I all I have to do is to buy a bunch of toppings. It’s a super easy meal for me to pull together because the guests do most of the work for me. 🙂 These parties are always a blast and everyone leaves having eaten the meal they wanted! My husband and I have what we call the “Three Toppings Rule”. If you have more than three toppings on a pizza then it sort of loses its identity. Meaning that it turns into a meal on top of bread. Think about it for a minute. If you have a “Taco Pizza” with like six toppings on it, what you end up with is a pizza that neither satisfies a craving for tacos nor a craving for pizza. Sure, it probably tastes good, but isn’t food like pizza all about fixing a craving? I sprinkled extra (raw) minced garlic on top of my pizza because I love, love, love garlic. 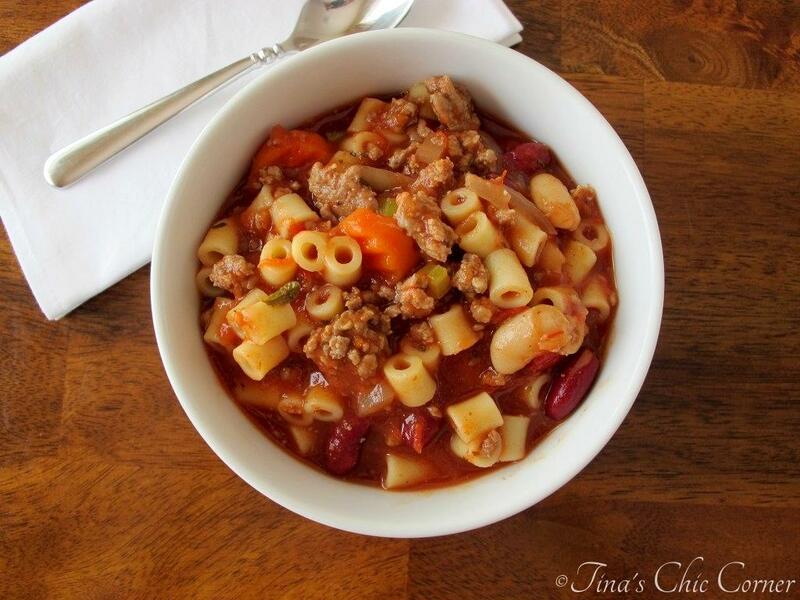 Here’s some other great comfort food ideas. What a great way to spend a Sunday! Love the rustic shapes and they look and sound delicious! I love garlic chicken pizzas. Heck, I just love pizza! And look how beautifully your dough came out. Now I’m definitely going to have to try your dough recipe. I’m legit going to make this today! Dinner was supposed to be pulled pork enchiladas but I woke up this morning and the pork was burnt to a crisp in the slow-cooker…don’t ask me how! I think I may skip the dough though because I’m lazy and make flatbread pizzas instead on the tortillas I was going to use for the enchiladas. I’ll let you know how it goes! I love that idea! 🙂 That stinks about the pulled pork… I rarely use my slow cooker so I couldn’t even begin to suggest what went wrong. This combo sounds perfect for a pizza! 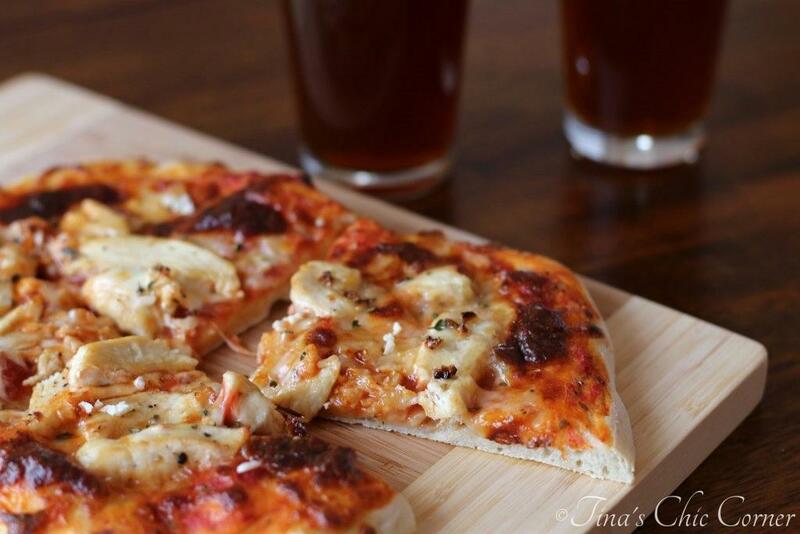 I agree – making pizza at home is the best since then you can make it exactly how you want! 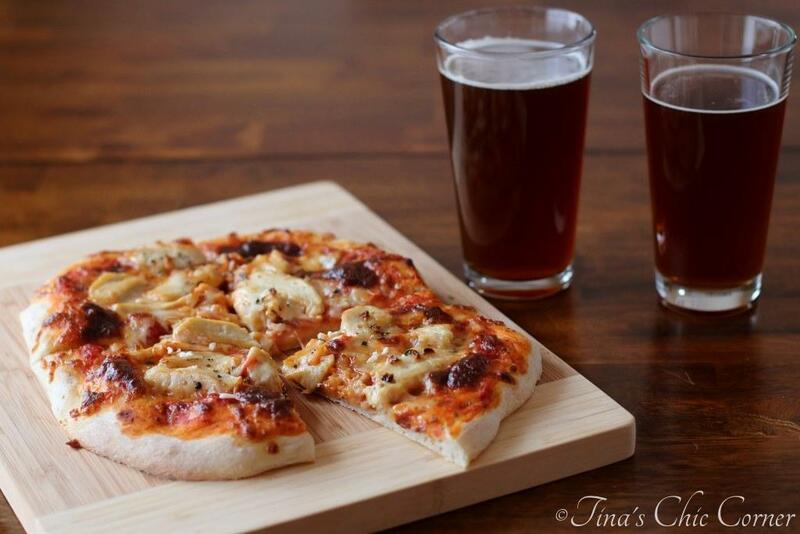 The husband loves pizza night around here : ) I need to try the pizza night dinner party idea – I love that! Homemade pizzas are the best! I love this extra garlic version. The more garlic, the better, in my opinion! This looks delicious, Tina! I could go for a garlic chicken pizza tonight…and it’ll keep the vampires away! This is a great night in type of meal in my opinion!! I love the pizza crust here and the toppings! It looks delicious!! Pizza is one of my favorites because it is do customizable! I love chicken and garlic on my pizzas. 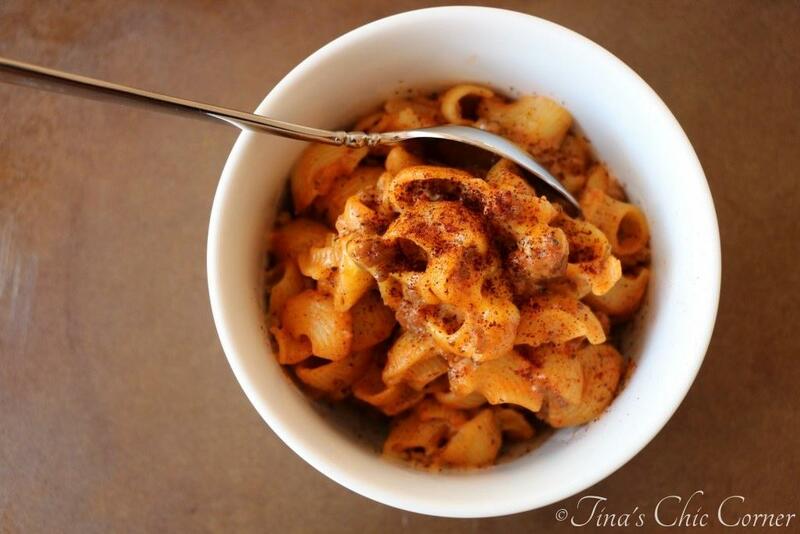 You know how to rock comfort food! We’ve had cold and grey weather, so this recipe is very welcome! 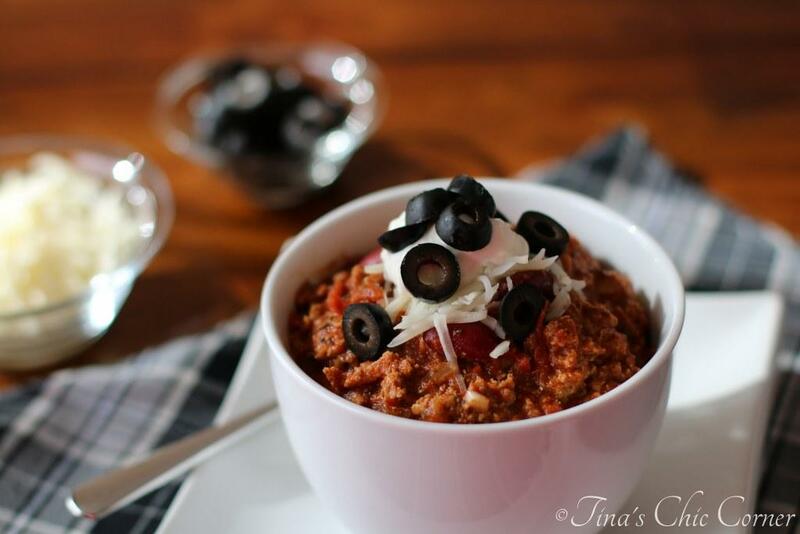 Wow, Tina this looks amazing! I love how so few ingredients can come together to make something so special. I need this pizza to happen tonight!!! OH MY – It looks amazing. You can’t beat homemade pizza! 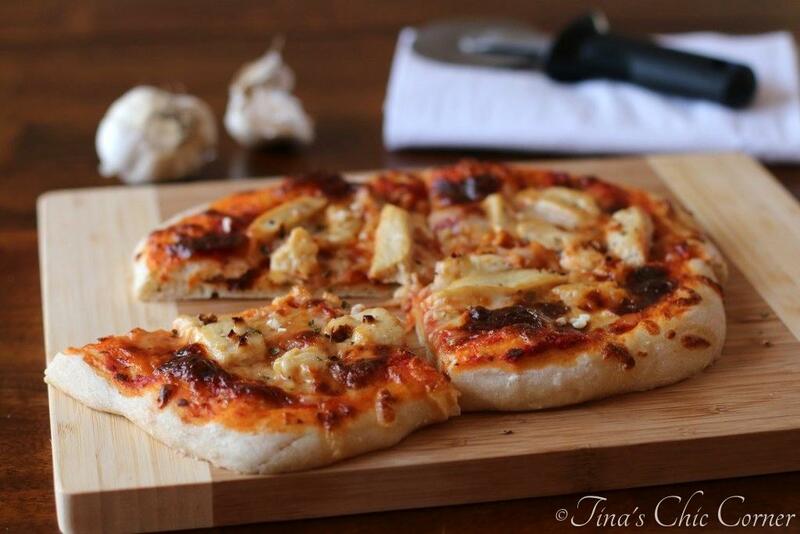 Tina, Friday night is our pizza night so this is going on my menu soon! I agree round is overrated. Great recipe – have a great weekend! Awesome sauce! 🙂 You too have a great weekend! That’s so cool that your husband enjoys cooking with you! It’s a rarity that my wife wants to join me in the kitchen… but she’s more than eager to try whatever I made, haha. 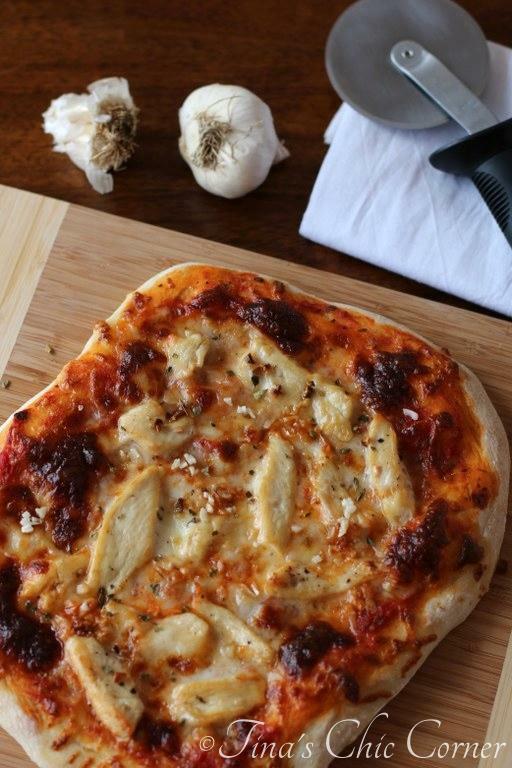 You can never go wrong with an awesome-looking homemade pizza! Yum!